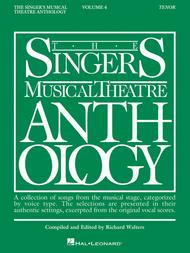 The Singer's Musical Theatre Anthology - Volume 4 - Tenor edited by Richard Walters. For Vocal (Tenor Voice and Piano). Vocal Collection. Songbook and 2 accompaniment CDs. 256 pages. Published by Hal Leonard (HL.499).ISBN 142342381X. 9x12 inches.The world's most trusted source for great theatre literature for singing actors. The CDs include piano accompaniments. The book features authentic editions of each song in the original keys. The songs have been carefully chosen for each voice type and are culled from a wide selection of classic and contemporary shows. 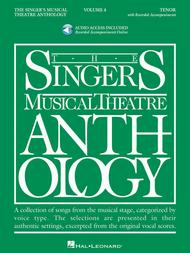 The Singer's Musical Theatre Anthology - Volume 4 - Tenor (Tenor Book Only). Composed by Various. Edited by Richard Walters. For Vocal (Tenor Voice and Piano). Vocal Collection. CD accompaniment available separately (HL.399). Songbook. 256 pages. Published by Hal Leonard (HL.395).ISBN 1423400259. 9x12 inches.39 songs, including: Awaiting You • Breeze off the River • Dancing Through Life • The Day After That • Fortune Favors the Brave • Free • Giants in the Sky • Goodnight Saigon • I Can Do That • If You Were Gay • Love Changes Everything • A Man Could Go Quite Mad • One Track Mind • She Cries • Stay • Tschaikowsky (And Other Russians) • What Have I Done • Who Am I? • Why • You Walk with Me • and more. There are no song duplications from any of the previous volumes. All songs are written in the original keys, in authentic voice with piano accompaniment. Also includes a Foreword, and an extensive section of show facts and plot notes about the shows.